Transforming high resolution scans of my ceramic work into vibrant graphics made exclusively for PANGEA. Self published from the ben medansky studio. This 144 page book culminates the last five years of Ben's art and design practice. With contributions by Frances Anderton, Jonathan Griffin, and more. 9.25" X 9.25" X .5"
Ben created a collection of sculptural vessels for a week long exhibition where he was awarded as a Rising Talent in design in America. Collaborating with designer Kelly Wearstler, Ben created a custom, towering, ceramic totem for the brand new Hollywood Proper residencies and hotel. The structure, which is over 7 feet tall, is prominently displayed in the reception area of the luxury complex at Columbia Square. Custom cups made for coffee giants Kyle Glanville and Charles Babinski of G&B Coffee. Herman Miller is synonymous with "modern" 20th century furniture design. Working with legendary designers George Nelson and Charles and Ray Eames, the company produced pieces that would become classics of industrial design. Ben has had the pleasure of creating iconic, one of a kind structures for Herman Miller and Geiger showrooms throughout the United States. In conjunction with his show at the POKETO flagship store in Los Angeles, Ben led an intimate ceramics workshop instructing on the basics of clay and the the art of the terracotta pinch pot. In a video lampooning the iconic scene from Ghost, Ben and Colby Keller threw a series of "Executive Desk Objects". Sales of the Objects went towards funding Colby Does America. Ben, along with fellow artists and friends Bradley Duncan and Lauren Spencer King presented GRIDSCAPE, shown at Space 15 Twenty. The exhibition explores minerals and cuboid crystal pyrite along with grids, radial symmetry seen in ceramic vessel, large scale peg works, and vertically erect cacti. Read more here. Ben created special edition vessels and ceramic bubble wands for the Cooper Hewitt Smithsonian Design Museum. Created especially for Contemporary Art Review LA (CARLA), these minimalist vessels were made in Limited Editions of 4. Ben was chosen to be a part of the Sight Unseen OFFSITE show at Austere Gallery in downtown LA. The pieces showcased included a small collection of Ikebana vessels alongside his distinctive, monochromatic architecturally influenced structures. 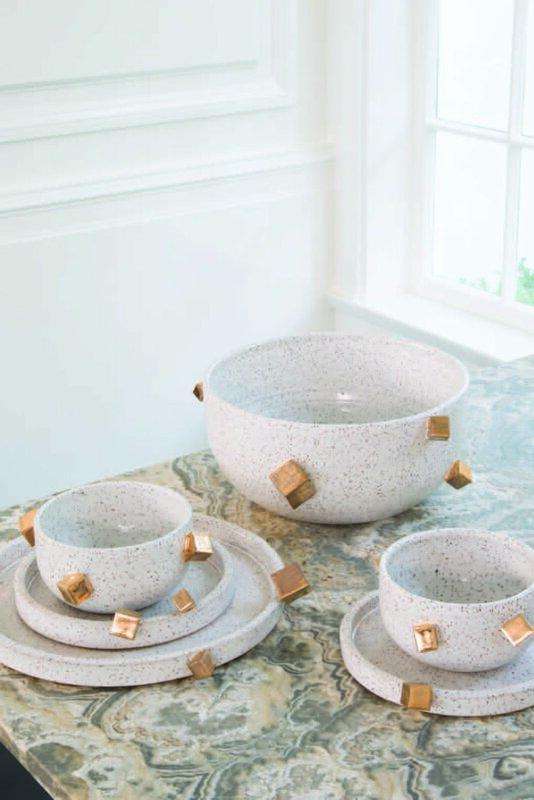 In the summer of 2015, Ben collaborated with designer Kelly Wearstler to create the exclusive Pyrite Collection. Sold in limited edition at Wearstler's Beverly Hills flagship store and Bergdorf Goodman of New York. Go Get Em Tiger (sister shop to G&B coffee) is home to an array of custom cups by Ben. Ben's pieces were used for prop styling for the brand Native Shoes. Ben created custom Pendent lights for Ryan Heffington's dance studio, The Sweat Spot. In 2014, Ben collaborated with AXS Folk Technologies and designer Kyle NG to create unique ceramic wares inspired by the urban outdoorsmen. As part of the project, Ben modeled his work in AXS ware. 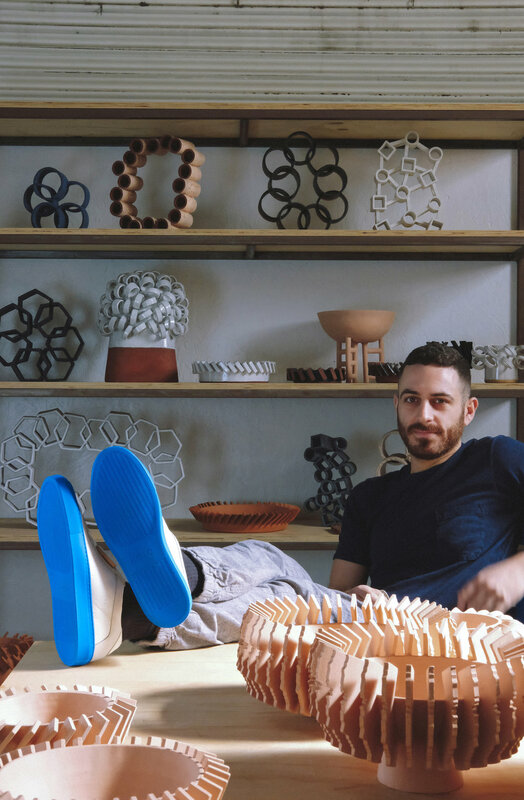 In a show at Lawson Fenning featuring the most influential ceramicists in Los Angeles, Ben created a collection of Radial Fin Vessels. These works are a further exploration into motifs of industrial aesthetics and experiment in mimicking strong forms out of a fragile material. Vessel is a charitable collaboration between Ben Medansky and DIG DEEP to help build clean, running water systems for the Navajo nation. The sale of each hand made vessel helps bring running water to roughly 40% of the Navajo people who still live without it. Ben has been a guest lecturer at a number of art and design institutions discussing his design process, methods, and the transition from art student to working artist. Lectures include School of the Art Institute of Chicago Ceramics Department, School of the Art Institute of Chicago Architecture, Interior Architecture, Design Objects, and New School for the Arts, and California College of the Arts.